Techseen: Apart from CRM, HRM, sales and accounting, which departments and industry sectors can use Sapho for creating focused micro applications? Lambert: The beauty of Sapho is that it is not limited to specific departments or industries. Any organization that has systems that collect and store data can benefit from Sapho’s ability to integrate multiple systems, monitor for changes that matter, improve workflows, and put actionable business information into employees’ hands. For example, Sapho micro apps deliver marketing teams proactive updates on web or campaign performance, they give managers a centralized way of reviewing employee PTO or expense reports across systems, and they provide account managers real time updates regarding tickets being closed for their customers – and in all cases, employees benefit from being able to take an appropriate action, such as approving a PTO request or emailing a customer, directly from the app. That is the great thing about micro apps – they are small, task-specific applications that deliver highly targeted functionality and allow users to accomplish single-purpose activities in a simple and quick manner. And, they can be built on top of any system. Techseen: What are the challenges that companies face in terms of app adoption? Have you faced any roadblocks while integrating your micro apps in companies? Which are the companies that you are planning to enable micro apps for? 62% of employees delay completing tasks that require they log into multiple systems. This means that current enterprise applications are failing to fulfill the needs of their users. And we have seen this first hand. For example, Super Deluxe, a Turning Broadcasting Company, struggled to keep multiple teams across the organization – all using different apps – informed on the state of current projects. By adopting Sapho, they were able to quickly unify data across all of their systems and deliver actionable updates to their team via simple micro apps. Then there is CBS Interactive who struggled with legacy applications that were hard to use, had hundreds of features that were never used, required significant training, and forced employees to complete time-consuming workflows. They looked to Sapho to replace many of their systems with micro apps and modern workflows that deliver a consumer-grade experience that their millennial employees have come to expect from business apps. Techseen: If companies spend thousands of dollars acceding to enterprise applications why should they chose Sapho and not onboard their employees with these enterprise apps? Lambert: Sapho is not meant to replace existing enterprise applications, but instead make these systems easier to use and make those who use them better informed. The Sapho Micro App Platform enables organizations to build secure micro apps, on top of these existing systems, to provide employees proactive insights and one-click task completion from a personalized Facebook-like feed. With Sapho, employees no longer need to log into all of the various systems they must access to do their job – instead, Sapho takes the important data, updates, and tasks from these systems and delivers it to the relevant employees, enabling them to have real time data and take immediate action from one place, wherever they are. That being said, micro apps will not replace the need of these systems for daily power users. For example, sales teams will still need to use their CRM for day-to-day pipeline activities, just like HR employees will need to use their HCM daily. However, micro apps simplify access to the data in these systems for the non-daily user. At Google, a Sapho customer, product managers don’t need access to a CRM but they do need to know when an opportunity is opened/won/lost for their product – Sapho allows the non-daily user to get proactive updates, like new opportunities, without having to log into a source system. Ultimately, Sapho helps the 99% of users who need occasional access to a system to get the personalized information they need to do their job. Techseen: Large legacy enterprise technology companies have started focusing on UI and UX, making applications and software easier to use. Sapho on the other hand provides focused micro apps for employees so that they stay up to date with information, without going through those large applications. Does this pose as a challenge to Sapho? Lambert: Despite steps that enterprise companies have made to improve UI and UX, survey after survey show it isn’t working. A recent Forrester survey found that while 72% of IT executives say employees know how to get the information they need from systems and apps, 91% of employees believe that simplified enterprise apps would increase efficiency. Take a look at some of the more recent enterprise systems, like Workday or Salesforce. Both were created to replace legacy systems, such as PeopleSoft and Siebel, yet both look exactly the same as their predecessors from 15 years ago. A new approach is needed – one that delivers information across all enterprise systems to employees via a simple, consumer-like app or via a channel an employee is already using, such as a web browser, massager client, or email. This is where Sapho comes in. Sapho integrates with existing enterprise software, pulls out important information, and provides employees a Facebook-like feed where they can maintain their to-do lists and view relevant data without having to access the source system – all without having to replace a single system. Techseen: Most enterprise applications are made for desktop/ laptop usage, is it true that companies such as Sapho address the mobile workforce in particular, bringing the functionality of enterprise applications to mobile devices? Lambert: Sapho is addressing a changing workforce – not just a mobile one. A quick look into the apps these employees use in their personal life show that employees want simple, personalized apps that can be used anywhere. This means that enterprise must provide their workforce with tools that are easy to use, that are personalized for each employee, and that are available everywhere. The challenge with thinking about app modernization as a “mobile solution” is that most employees still sit at a laptop for many hours a day. Yes, they want a new solution to address their mobile needs, but they also want a better solution when they are sitting at their desk. Sapho has built its solution to cater to the needs of employees wherever they are and how they want to be communicated with – sometimes this means sending an email notification about a new lead or pushing a notification through a Slack message informing an employee about a PO that needs approval. Regardless of the channel, our goal at Sapho is to make the data and tasks buried in enterprise systems accessible to employees wherever they are. And yes, mobile is absolutely one piece of that, but certainly not the only piece. Techseen: Post a raise of $9.5 million earlier this year, there was speculation that Sapho will integrate machine learning for developing apps that look into intra-company system translation which can be used by supply chain and sales channel enhancement. Is this true, if so how will it benefit your target audience? Lambert: We are deep into adding machine learning throughout the product. We believe that surfacing relevant information by learning what employees are actually engaging with – and learning from what similar peers are engaging with – will help us better deliver the right information to employees. Stay tuned here! Techseen: According to you how can micro apps change the enterprise landscape? Will they be in any way challenging the existence of heavyweight enterprise apps or will they act as an added feature/ attribute to large enterprise applications? Lambert: Most enterprises simply do not have the ability to rip and replace their legacy systems – the systems store too much data, too many workflows, and too many customizations that make potential upgrades/replacements not an option. Micro apps provide an enhancement to these systems by allowing them to stay in place while at the same time improving the user experience and driving usage of systems that many wanted to forget. Micro apps also act as a new feature for these existing apps – they help employees make smarter and faster decisions by proactively pushing relevant information and actionable activities to a single place where employees can review data and complete tasks in a single click. Techseen: Where do you see Sapho 2-3 years from today? Will AI become a pre-requisite with micro-apps for a seamless user experience? Lambert: People need a new – a better – way to access their systems and have actionable data surfaced to them. There is simply too much on people’s plate to have them looking for data manually. 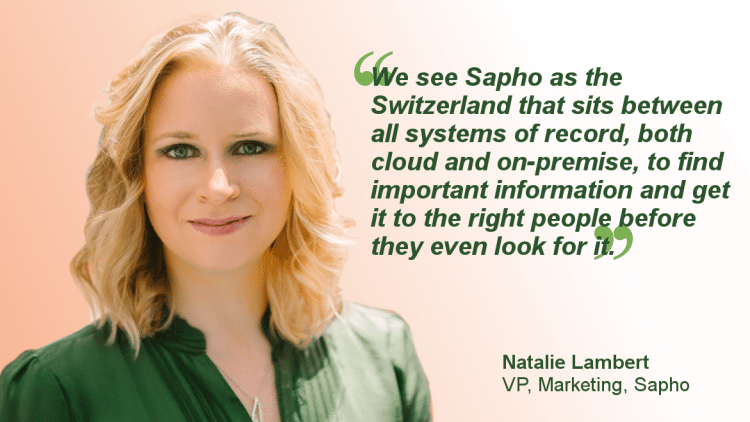 We see Sapho as the Switzerland that sits between all systems of record, both cloud and on-premise, to find important information and get it to the right people before they even look for it. And the more we can intelligently help employees make the best decisions with the new information now at their fingertips, the more we become part of their workflow and simply part of how they work. PreviousIBM to do blockchain project with fintech start-up KYCK! IBM to do blockchain project with fintech start-up KYCK!